Andrew Troth lives a life many geeks dream of: he helps run a successful theater company, the Chameleon Theatre Circle, and is the owner of a comic-book store, Mind’s Eye Comics. 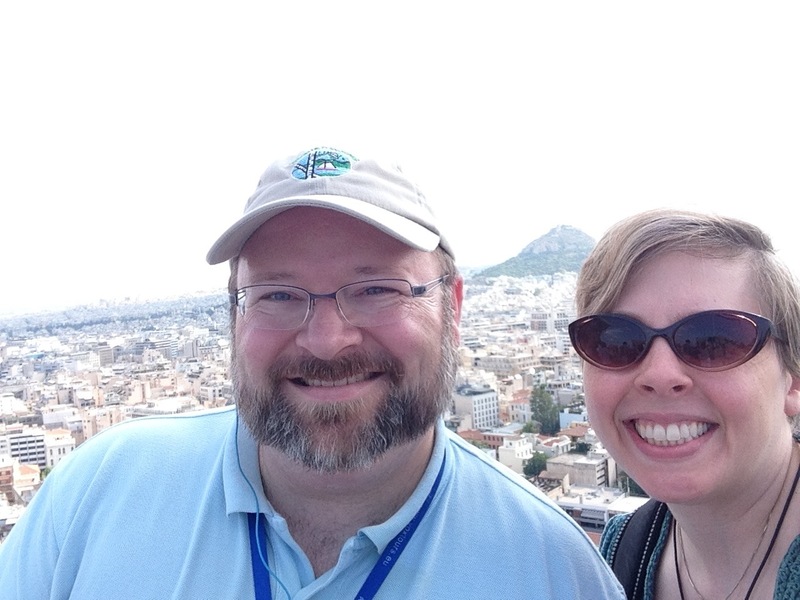 I recently talked with Andrew about his good fortunes, the metro-area suburbs, and all manner of geekiness. Self-portrait by Andrew at Mind’s Eye Comics. Duck Washington (TCG): What does the word “geek” mean to you? Andrew Troth: These days it has a very positive connotation for me. A geek is a person who is heavily invested in a subject that really fascinates them. We talk these days about being a comic-book geek or a theater geek, but you can also be a sports geek—you can be any kind of geek. Whatever niche really fascinates you, that can be your geekdom. When I was growing up, being called a geek was simply an insult; it had connotations of being weak, uninteresting, weird, or unpopular. I’m really happy to see the term evolve linguistically into something that is much more neutral or even positive in some cases. The geeks who were persecuted have claimed ownership of the word and made it into something that can be celebrated which I think is something that is a great thing to do. TCG: What areas of geekdom are you interested in? Andrew: Comic Book Geek and Theater Geek are really the two main ones for me. I fell in love with theater around sixth grade when I saw my brother perform in a couple plays and thought that it looked like an interesting thing to do. At the time I wouldn’t have been able to articulate what drew me to it, but now I can say I love the way theater facilitates communication between people of different experiences and different viewpoints, the way it can help us understand each other, or the way that it can free you from the things that bother you. There are endless possibilities in the theater for creativity. I see a lot of the same opportunities in comics. Comics are an art form and a means of communication that is limited only by the imagination and the skill of the person who is doing the work. One person can sit down and create an entire universe. In both cases, what really fascinates me is the wide open possibility of doing whatever you can think of. TCG: Do you have a favorite comic-book character? Andrew: Not a single favorite character, but I got into comics reading Legion of Super-Heroes, and that remains my favorite title and favorite superhero group to this day. It’s not just one of them, but the entire massive, confusing team with a history that’s been rewritten a dozen times over the decades. I just love that whole . . . mess. It’s set one thousand years in the future and it’s amazing to see how the envisioning of what one thousand years from now looks like keeps changing over the course of its publishing history. It’s also not just the single pathos-driven guy on his own. It’s all the interactions and conflicting relationships that really drew me in. It’s kind of a soap opera with superheroes in the future. TCG: If you could have any superpower, what would you choose? Andrew: I’ve had many answers to that question over the course of my life, but I think that the one that I would choose right now would be teleportation. That or being able to create duplicates of myself who could operate independently and get various things done at the same time. Andrew in Return to the Forbidden Planet (photo by Scott Pakudaitis). TCG: Tell us a little about Chameleon Theatre Circle and how you got involved with it. 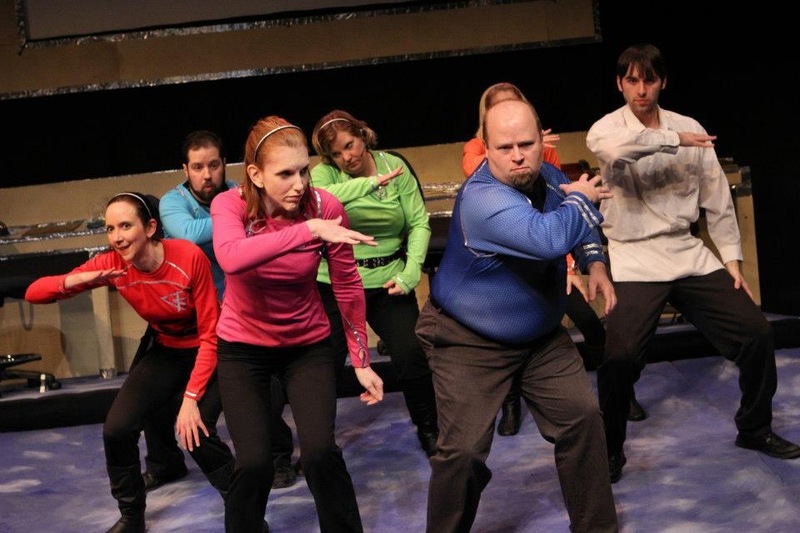 Andrew: Chameleon was founded in 1997 by some people who were involved with various community theater groups in the Burnsville, Apple Valley, Eagan area that wanted to get away from doing some of the standard, stereotypical suburban community theater shows. Shows focused on having the largest possible cast with lots of kids, where everything is family friendly and everything is familiar. That’s fine, there is anything against it, but there was a group of people that said, “I want a different kind of theater and I don’t want to have to go into Minneapolis or St. Paul to do it or to see it. Let’s form our own company here that will do the works you don’t expect to see in the suburbs.” The first season included shows like The Foreigner and The Baltimore Waltz and something called An Evening with the Illuminati. A production of Assassins won some awards and gave them some momentum, and the company has been doing between four and six shows every year since then. I got involved in 2006 after a theater hiatus of my own. I was living in Eagan and noticed that there was a theater company doing a show in our backyard and was just feeling that itch to get out of the house. We had kids. We saw a show called The Shadow Box, which is a character drama that gets kind of dark and is intense and isn’t the sort of thing you expect to see in the basement of a restaurant in Burnsville. [Chameleon is now housed in the Ames Performing Art Center.] I auditioned for their next show and got cast and have been involved on some level ever since. Corinna [an awesome theater craftsman who also happens to be Andrew’s wife] worked on the next show as a stage manager and set builder. We traded off shows for a while, and then I was asked to join the board in 2009 as treasurer, and in 2011 they need a new president and I was the guy who got the job. 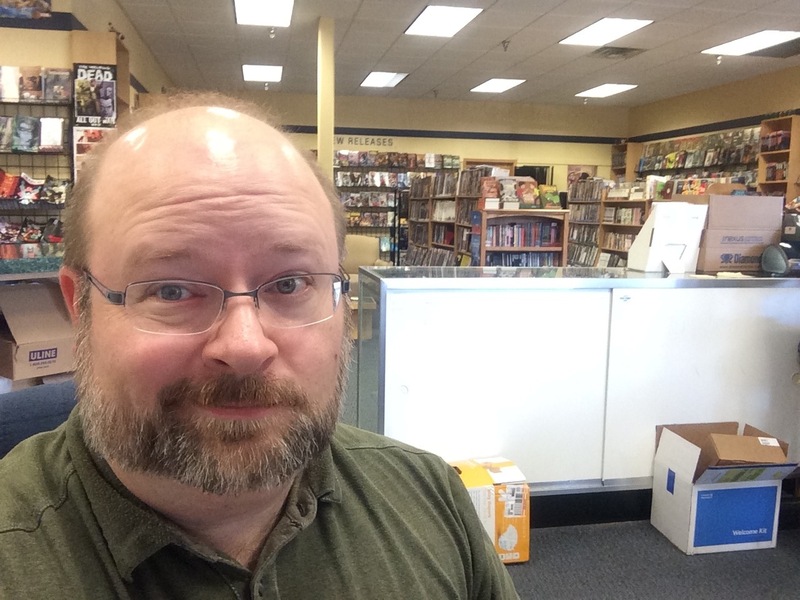 TCG: I’d think owning a comic store is probably pretty high on many geeks’ lists of fantasy jobs. What’s the reality of it? Andrew: I get that all the time. I say I own a comic-book store and people say, “Oh, that must be a really fun job.” And yeah, it is. I created this store because I love comics and I wanted to make sure they stay available. I saw a niche that needed to be filled, again in a suburban area, that would offer the level of service that I would like to see as a customer. At the same time, the trouble with making something that you love into your job or your profession is that then it becomes work. And, of course, nothing is ever entirely under your control, even as a small business owner. Yeah, I’m in charge of the business, but I’m still beholden to my landlord and my distributor that I get all the comic books from, my customers, and employees. I never wanted to join a corporate hierarchy, which is why I created my own business, but once you’ve done that you’ve created a hierarchy of your own. I can look around and see why people would say, “It’s a great job—you get to read comic books all day.” Actually, I mostly sit around and try to figure out how many comic books I should order all day so that I have enough to supply all the people who want to buy them and not so many that I’ve stuck all this cash into something that is never going to sell and I go out of business. I can’t say its not a great job. I know there are far crappier jobs out there, but its not that it doesn’t come with its own stress, responsibilities and problems. TCG: Lastly, who is your favorite captain? Andrew: Malcolm Reynolds. I think Nathan Fillion is a brilliant actor and Joss Whedon is a brilliant writer, and Firefly was one of the best sci-fi shows ever created and no matter how many times you watch it it’s fun and creepy and engaging and is such a great collection of characters with different viewpoints. I loved Mal’s brokenness of being through a war that turned out badly for his side and how he then had to go and continue to make a life for himself. I think there is a nobility in the way he was able to accept the things that came to him and the people who needed his help. Andrew and Corinna (photo by Corinna Troth). Andrew is directing an upcoming production of Betty’s Summer Vacation by Chrisopher Durang, which will be playing at Chameleon Theatre Circle from May 29 through June 7. More information on the show and Chameleon is available at chameleontheatre.org. Derek “Duck” Washington is an actor, director, audio designer and playwright in the Twin Cities area. He is a member of Vilification Tennis and Fearless Comedy Productions, is a producer for Encyclopedia Show: Minneapolis, and the founder of a small theatre company, Rogues Gallery Arts.